After my previous posts, some of our readers asked me if the Wahl Bravura I use is the best choice among the best dog clippers for thick coats. You don’t really want a cordless clipper. 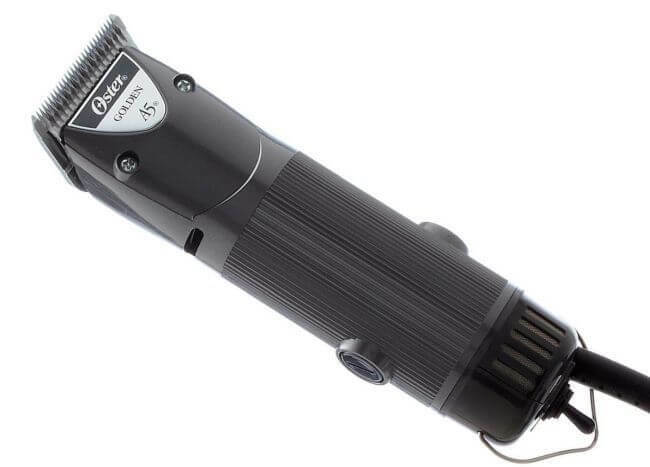 Instead, it’s best to go full out corded with something like the Andis Super AGC (2-speeded) on Amazon.com, heavy duty best dog clippers for matted hair. I know, I know: you love the mobility and how flexible wireless pet hair cutters are. But thick coats are a stubborn bunch and they need a plugged in beast. 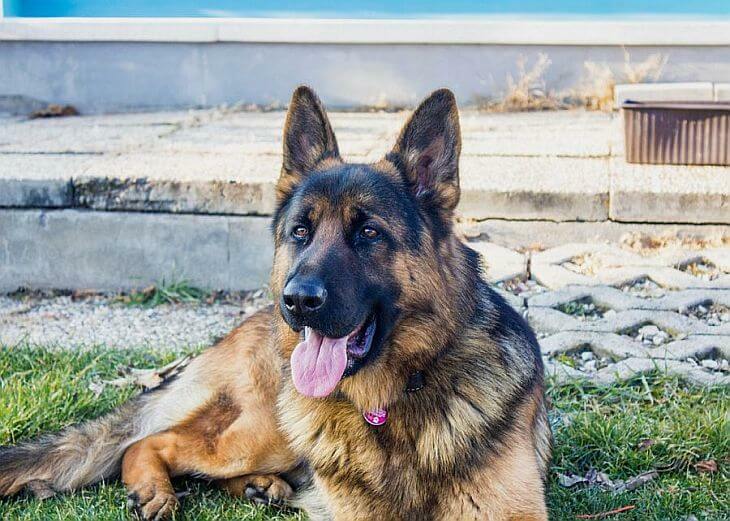 In this article I’ll introduce to you the 4 best dog clippers for thick coats and matted fur. All of them are corded, but there are some differences I want to elaborate on. I’ll also give you some tips re: removing matted hair. Well-rounded choice, combining good price with strong performance and extra durable body. 7.13" and semi-heavy at 1.1 lbs. Andis steel blade #10 included. Long-lasting brushless motor, extra quiet operation & Wahl's best steel blades. 7.5", very lightweight at 12.3oz. #10 Wahl Competition series steel blade included. 5 speeds to groom smarter, cooler ceramic blades and best overall thick fur performance. 6.63", lightweight at 0.80 lbs. Good performance on the most affordable price among cutters for thick coats. Heavy at 1.97" lbs, prone to getting hot. Steel Cryogen X #10 blade included. If you factor in price and pair it up with performance, the most well-rounded result would be the AGC Super 2-speed. It’s probably one of the most common best dog clippers for thick coats model you’ll see the most in dog grooming salons! So, what’s in for you and your pets here? 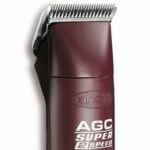 The AGC 2-Speed is a classic for anyone seeking to cope with thick fur frustrations. Its low speed revvs it up at 3400 SPM, while the higher shoots to the skies with 4400 SPM. Quite the performance, though I once again want to mention that 3400 SPM might be too powerful for more skittish pets. Ergonomics are taken care of, but at 1.1 lbs and some 7.13″, the AGC isn’t as convenient and groomer-friendly as the Excel. No rubber-grip coziness either, but the break-resistant, extra durable housing will take care of clipper longevity. Some people like to use them for poodles, but I actually prefer other poodle clipper options if you want comfortable grooming. Another difference to Andis’ other great choice – the 5-speed Excel, is the carbon steel #10 blade. You’re not getting the ceramic treatment here so you could expect things getting a little bit hotter. Not as hot as the Oster, though! All in all, the Super 2-speed AGC works like a charm on a very balanced price. It’s a staple for dog groomers and more professionally-oriented DIY groomers alike. No storage case included, unfortunately! This machine right here is a real steal. The Excel 5-speed will plow through any hair that’s otherwise nightmare to cut. Absolutely no compromise and maybeAndis’ most versatile heavy duty clippers for thick fur. Some people prefer it to the AGC 2-speed due to two things: more speed choices, and the ceramic blade. Let’s start with the 5-speed motor thing. 2500 to 4500 strokes per minute give you way more control over grooming your hairy pal’s thick coat. You can adjust them according to the area you want to take care of or how anxious the dog you’re cleaning up is. Another thing I like more here are the ergonomics and the 12.5oz only weight. You have a soft-grip housing that’s one of the most convenient bodies out of the pro groomer clippers. Pair it up with how lightweight this thing is, and you’ll skip on wrist fatigue for sure. As with some of the higher-end Andis clippers, you get a #10 size ceramic blade with the Excel Pro. It stays rather cool, but if you operate at 4500 SPM it will inevitably get a bit warm. Remember to spray it with a cooling agent while you’re working on that thick undercoat. My main complaint would be the fact that there’s no case included with the set. You’re paying quite a few bucks, surely that means you’d get somewhere to store this beauty? I wish Andis would add this little finishing touch to the best dog clippers for matted hair out there. Also, it costs a bit more than the AGC 2-speed. 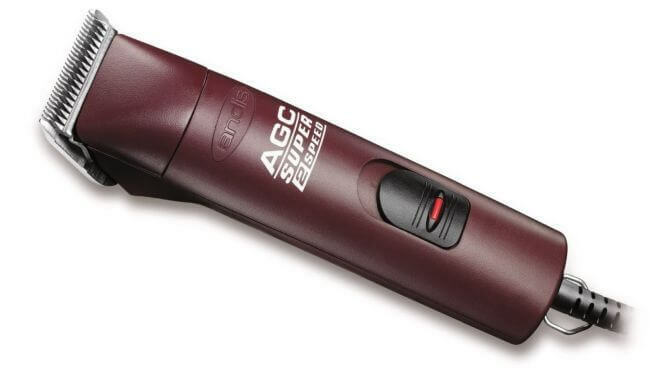 For standard use, the Excel doesn’t go that much above the AGC – and that’s why you’ll see more AGC 2-speeds in grooming salons for pets. The monster power KM10 is Wahl’s answer to Andis getting the Excel out. While confined to only 2 speeds, this model has a roaring brushless motor with extended lifespan. After all, you’re making quite the investment here, right? 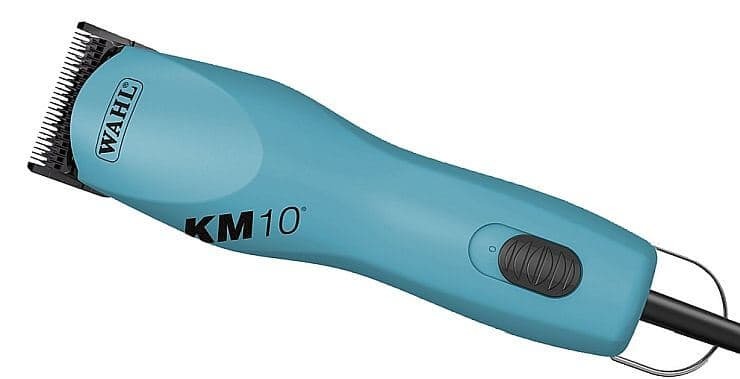 I’ll tell you something: quite a lot of horse owners use exactly the KM10 to do some quality horse trimming. This should speak volumes about its capabilities. Where this clipper for matted dogs also stands out is silent operation. Andis models are powerful, but sometimes they buzz too much for my own liking. The KM10 stays quiet, which makes it great for extra skittish pooches. Don’t think it doesn’t pack a punch, though. At 3000 or 3700 SPM, its motor delivers quality performance, despite not being as spectacular as the Excel 5-speed. Once again thinking about your comfort, Wahl have made this monstrous beauty quite ergonomic. At 12.3oz, it’s even a little lighter than the Excel 5-speed. The slightly curved design makes sure it fits your hands properly, minimizing both vibrations and wrist fatigue. The blade is once again a standard #10 size, but there’s a catch: it’s from Wahl’s Ultimate Competition series. While not ceramic, rather heavy duty stainless steel, it shows Wahl’s most elaborate blade design and long-lasting quality. The only drawback is the cord that feels somewhat flimsy. A few people seem to complain about it getting damaged…but it really depends on how you move the machine around too. Just be careful and don’t stretch it too much and you should be fine. 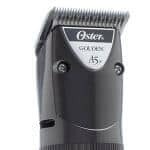 I can’t do the whole professional thing without mentioning Oster. The brand is famous for its extremely heavy-duty clippers for long hair dogs prone to matted knots. The 2-speed Golden A5 is a prime example of these. But, once again we get the usual A5 problem: heating up and the rather heavy body. This quite powerful fellow weighs around 1.97 lbs. Yep, you read that right: that’s twice the weight of both the KM10 and Excel 5-speed. For some people that won’t be an issue, but honestly, your hand will get tired at one point. The usual universal Oster motor also generates a lot of heat and you’ll need to take more frequent breaks according to my observations. On the upside, this set of thick hair clippers is way more affordable than the previous contestants. If you’re on a budget and still want to get exquisite results, that’s your best friend. Aside from the heavy body and the attention you need to pay to cooling it off, the A5 is A+ in terms of performance. No knots, no mats, no thickness can stand in its way. How to groom a dog with matted or extra thick fur? In some especially nightmarish cases, you really want to start with a dematting comb before starting with the clippers. Professional clippers are one thing, but if there’s a whole jungle of knots on the dog’s fur, they won’t be able to cope. Grab a comb like this favorite GoPets dematter on Amazon.com of mine and gently, but firmly, brush through the body. Once the mats are under control (not gone, but ready to be taken on with a clipper), switch to the fur cutter. You could also use pet scissors to achieve the same results, but a dematting rake gets things done faster and more conveniently. Also, if you’ve bathed your dog, make sure the hair has dried out properly. If your dog’s hair is longer, chances are the thick matted areas will obstruct your vision. Instead of jamming the clippers and starting the grooming process, take your time. With slow, delicate motions pull the skin a little and divide the knots so you can see clearer. You need to be aware where the skin actually starts, otherwise you might wound your dog. Remember: professional clippers come with pretty sharp blades. Get a feel of the coat and continue working section by section without rushing through it. Also, keep in mind that getting a #7F size blade, instead of the stock #10 sized blades can achieve better results. It leaves hair a bit longer than the #10, but this lets it get through thick matted hair easier. You can always change to a #10 after the biggest knots have been taken care of, and groom your dog to a shorter length. I have the oster a5 turbo with blades number 7 and 10.
we have 2 dogs with very thick fur and undercoat. but the machine is not working good with this fur. I needed for one dog more than 3 1/2 hours…. is there a better blade for my case/? or should I buy another machine? ?